The Sumo Logic App for Data Volume allows you to view at a glance your Sumo Logic account's data usage volume by Source Category, Collector, Source Name, and Source Host. 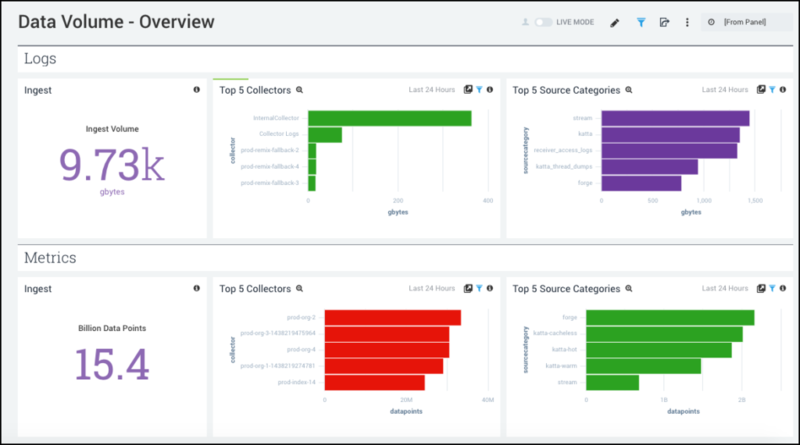 The app uses predefined searches and an easy-to-use dashboard that provide visibility into your environment for real-time analysis of overall usage. The Sumo Logic App for Data Volume includes four pre-built dashboards to help understand your usage: Data Volume - Overview, Data Volume - Logs, Data Volume (Logs) by various metadata fields, and Data Volume - Metrics. The Sumo Logic platform centralizes and translates your log data into digestible, actionable insights that help you move your business forward.